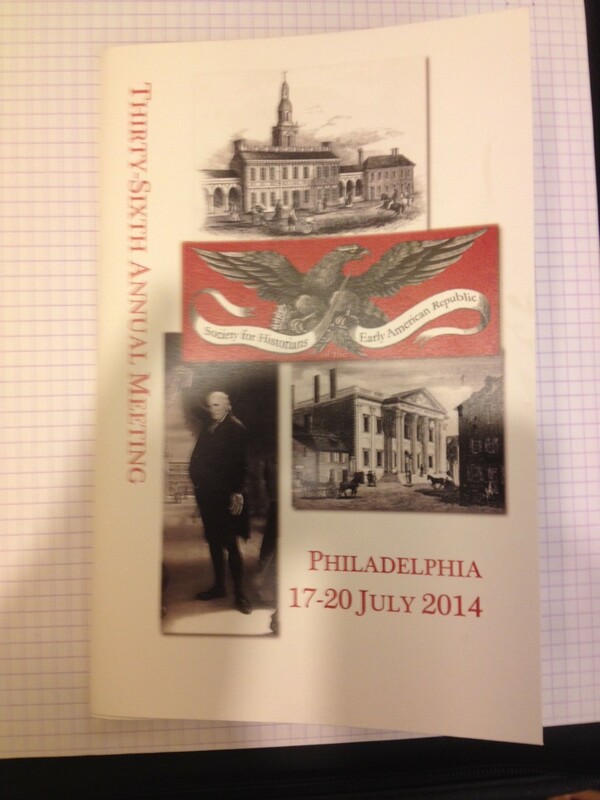 I just returned home from my most digitally enhanced annual meeting of the Society for Historians of the Early American Republic (SHEAR) yet, so it only makes sense that I capture my reflections on that experience in digital form. As always, I am impressed by what a generous group of scholars has been drawn to SHEAR’s flame. With a few exceptions, the official comments and audience questions were gentle, constructive, and aimed at enhancing our understanding of the past rather than scholars’ egos. And I think this spirit is extra impressive in a group of people who study a period in which the American ideology of competitive individualism was first finding its footing and its ideological power. And again, as always, I am captivated by the sheer quantity of compelling stories in the average SHEAR session. * This observation probably isn’t specific to SHEAR as a conference, since history conference in general have a lot of stories. But SHEAR seems to be especially populated by historians who value narrative; or more precisely, by historians who are especially alive to the ways in which events and lives can teach us about the past. In general, I think this is why history is unique and important as a modern scholarly discipline: it is one of the few that values narrative and analysis in relatively equal measure, and I think it is the most reflective about the relationship between the two. And this tendency is on display in spades at SHEAR. A name tag that definitely has to be taken off when leaving the hotel. 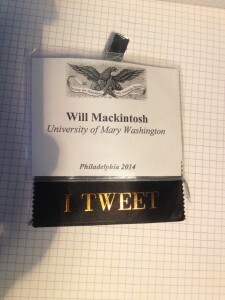 Finally, I was struck by the ways in which tweeting the conference changed by experience of it. I kind of fell backwards into the live-tweeting game. 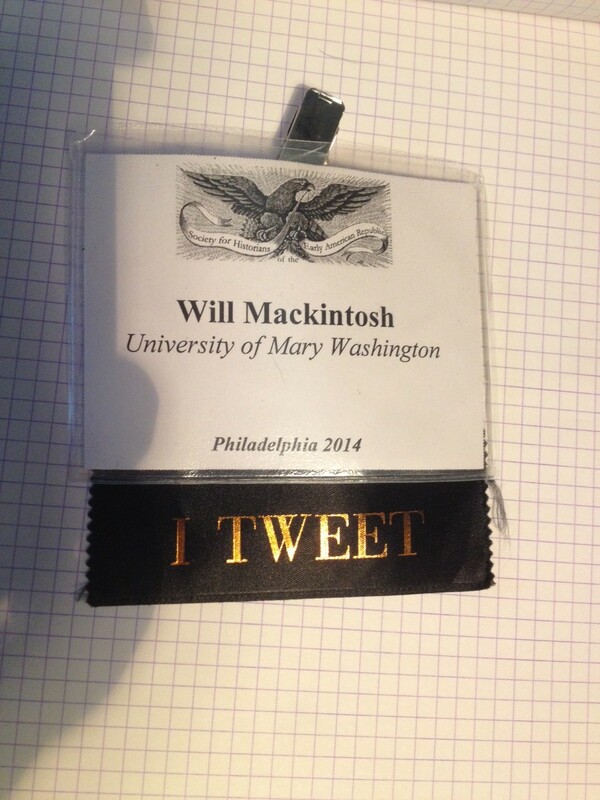 I was alive to the possibility because of our lively discussions of the scholarly utility of Twitter during last spring’s Domain of One’s Own Faculty Initiative, and then at the moment of registration, I was handed an “I Tweet” ribbon for my conference name tag (generational profiling) and it seemed like I should take it, stick it on, and try to live up to it. The model of live tweeting I had most often witnessed, particularly at academic conferences, was a kind of live serial summary, in which audience members offered titles and quick summaries of papers and comments they were listening to. I tried this serial summarization for a bit, and while it had something of a beneficial effect in that it forced me to pay attention to the big picture argument of the paper, it felt a bit rote, a bit too much like work. But beginning with Friday evening’s “SHEAR meets STEM” plenary at the College of Physicians of Philadelphia’s Mütter Museum, I began to tweet my reactions to what was being said, rather than a summary. That shift made tweeting ultimately more rewarding in that I could think through what was being said in real time. In a few panels, as well, my thinking-through intersected with the thinking-through of other tweeters, creating a double-layer conversation that ultimately enriched my understanding of the topic at hand. Now that I understand a twitter model that works for me, I’ll accept the “I Tweet” ribbon with more enthusiasm next time. Which makes me excited (as always) for #SHEAR15 in Raleigh. * Did you see what I did there? Two things, first of all, the Mutter museum is one of my favorite places on earth! (Jeff does not agree with me about this one though.) I could spend hours in there completely fascinated. Second. I’m currently at an education conference and was tweeting during this morning’s keynote. The conversations I ended up having on twitter (both resulting from my tweets and my responses to others) were immensely satisfying and thought-provoking. And truly, was more interesting than the actual keynote. His words prompts us but we (some in the room and some not) went much further.